Simplify Your Life and Let Us Come to You! Give us a call and we'll deliver the mobile storage container to your home or business. Our pickup and delivery equipment is "NO TILT", which keeps your items secure. 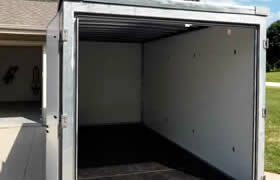 You can store it at your location, or call us up and we will transport it to our secure facility and store it for you. ➤ We’ll move it where ever you like in WI. ➤ Our storage site is fenced, under 24/7 video surveillance, and has an on-site manager. As a great alternative to traditional self storage, our mobile storage containers are becoming a simple choice for your home and business needs. 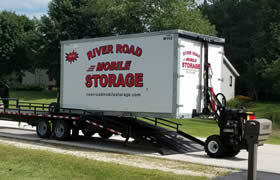 At River Road Mobile Storage, we offer both mobile and traditional storage options, but if you are looking to make storing your items easy, let our mobile storage team show you how to get started. A great reason to use our mobile storage solutions starts with no need to load and haul your items to a storage facility, then unload and load them back into a storage unit. Plus, if you want to keep the mobile storage container on your property, you can, but if not, we have a secure facility and we will pick it up and bring it there for you. If you are moving throughout Wisconsin, don't rent a truck. 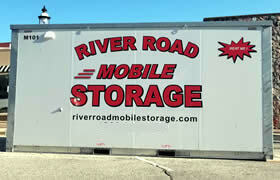 River Road Mobile Storage has made it easy. We will deliver our mobile storage containers to your location, then pick it up and move it to your new location when you are ready. Now, that is Simple. If you are ready, get started by clicking below.